When it comes to fighting fraud at retail bank branches and ATMs, few tools deliver the benefits of integrated surveillance video and transaction data. 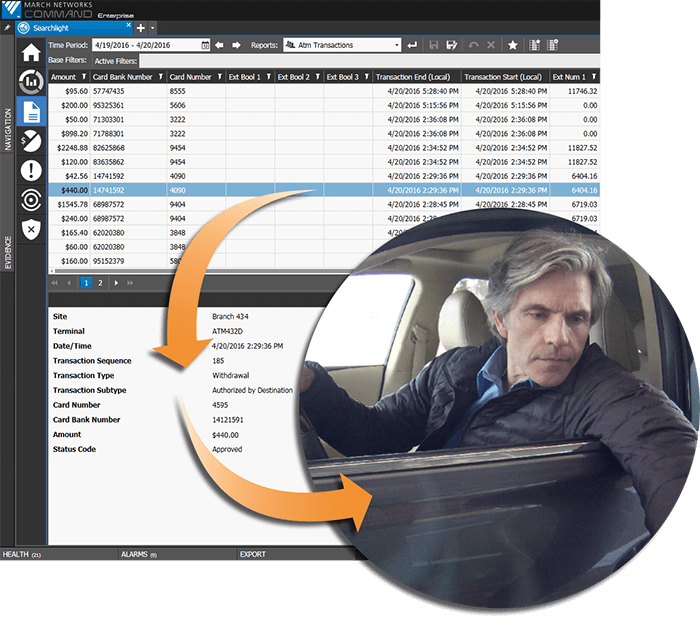 Combining video with data from your bank’s central transaction server enables investigators to search across multiple branches simultaneously, and drill down into the specifics of individual transactions. Depending on the type of software solution you deploy, investigators can search by card number, account number, or transaction type, and then match transactions with corresponding video and receipts. This type of search capability can rapidly resolve customer disputes, verify facts and find evidence of fraud or other criminal behavior. The right kind of video software solution can also rapidly notify you about suspicious activity, so you can learn when someone is lingering in front of an ATM but not making a transaction, or when a certain bank teller is routinely handling high-dollar transactions, or opening and closing an unusual number of accounts. Indeed, the benefits of a video/transaction data integration are clear. But what many financial institutions may not know is how to go about starting the integration process. Depending on the size of your bank or credit union, and where your transaction data is stored, you may have to make some special requests and complete some paperwork to get the ball rolling. What follows is a bit of advice to help guide you through the process. When we work with financial customers, we suggest they start by talking to their certified March Networks partner about their current surveillance system and what they hope to achieve with a video/transaction data integration. There may be special requirements depending on the age of your security equipment, your network environment, and the type of software and cameras you’re deploying. Your partner, along with a March Networks sales representative, will give you some direction on any upgrades that may be required. At this stage, you should also determine the scope of the integration you’re interested in. Is it only ATM data you want to integrate with video, or teller data too? Determine what data processing platform your institution uses and where your data resides. Is it managed in-house by your bank’s IT department? Or by a third-party financial solutions provider? If a third-party is managing your data processing, discuss your integration intentions with them. There may be contractual rules that stipulate how, when and how much data you can access and under what circumstances. It’s important to review the guidelines around obtaining your transaction data, and any service charges or monthly fees that may apply. Like any other business system integration, you’ll need to demonstrate the value of a video/ transaction data integration. A cost-benefit analysis can help show your senior management team what it can expect in terms of return on investment (ROI). If you’re looking at a March Networks Searchlight for Banking integration, you’ll want to cite the considerable time savings fraud investigators can expect (several minutes to find video evidence versus several hours) as well as the cost savings attached to that. Remember that video can also help improve other areas of your bank – like marketing and operations – by providing additional insights into branch activities, the customer experience and employee behaviors.